Street Fighter II is a game that I have long believed should have stayed in the arcade. And I have to say I wasn't particularly impressed with this slot tie-in when it was released. I think it is the 3D animated characters that really bug me, which look like a poor imitation of the real thing. The actual symbols on the reels are better, but it was always going to be hard to live up to the legendary arcade fighting game. Hadouken! 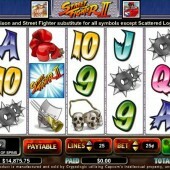 Street Fight to Win Prizes! There is just the one bonus round in Street Fighter II, which is triggered when your chosen character; Ryu, Ken, Chun Li, Guile or Sagat appears on Reel 2 and Bison appears on Reel 4. This will start the street fight, with punches, kicks and special moves initiated by a small fist or foot appearing on symbols on Reels 1 and 5. You get cash wins with each punch or kick you land on Bison. Sounds a bit complicated, but if you check out my video under the ‘Video’ tab then it should be much clearer. Reel 2 and 4 remain wild during the bonus round, with 25 paylines to create winning combinations on. 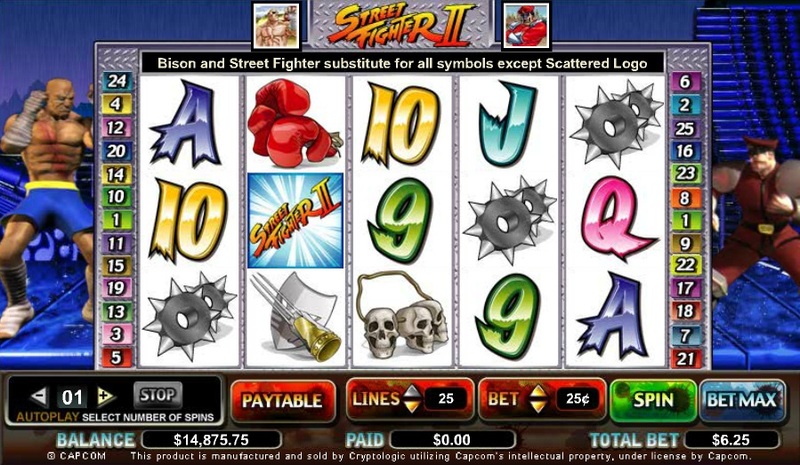 As I mentioned earlier this was a big ask for developer Cryptologic, to create a slot based on Street Fighter II. I don’t like it, but I am told that it is actually quite popular, so what do I know. If I am going to play any slots for the Cryptologic range then I am most likely to head towards the luxurious and lavish Millionaires Club or the aquatic-themed Captain Nemo.